“Silent” isn’t the right word to describe your furnace, but “squeaky” shouldn’t be either. 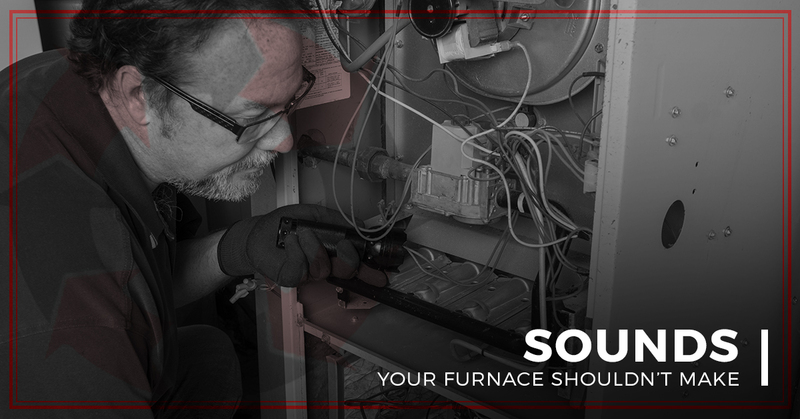 Because furnaces emit mechanical sounds when they’re working properly, it can be difficult to determine when a sound emanating from your furnace is normal or a cause for concern. Preventative furnace maintenance is a far better option than full furnace repair, so it’s worth taking the time to make sure your furnace is in good working order and not in need of any HVAC service. Check out these five sounds that indicate your furnace might need repair! Booming is never a sound you want to use to describe your furnace. Unfortunately, a “booming” sound can be a common indicator that an older furnace is on its last legs — or potentially poses a danger for the household. A furnace usually booms if there’s a gas build up and delay in the ignition of the furnace. If this sound is also coupled with natural gas fumes, you’ll want to call your HVAC service as soon as possible. If your furnace is clicking — think about the sound of lighting a propane grill or gas stove — then it’s also a sign that it might need immediate HVAC service. A clicking noise generally means a faulty flame sensor for your furnace. It might also indicate an issue between the furnace ignition and the gas source. When it comes to gas furnaces, it’s always better to err on the side of caution. Even if you think there just might be an issue, calling an HVAC company is a better bet than risking an exploding furnace. You know that sound your car makes when it needs a new serpentine belt? That squealing sound is the same you might hear when your furnace needs a new belt or fan motor. This sound doesn’t usually indicate as much of an immediate need as a boom or a click, but it still merits the attention of an HVAC company. They can easily check out the belt and fan motor and replace them if needed. If a rattling sound persists, you might have an issue with your fan belts. Your furnace might rattle if it hasn’t been used in a while and if it’s the first cold day of the season. If the rattling sound continues for longer than a few days, however, you should call a local HVAC company. If your furnace sounds like it has a few baby chicklets in it, then it could indicate an issue with the fan belts. As with a rattling sound, you’ll want to wait a bit to make sure the sound continues — especially if it’s the first time you’re using your furnace in a while. About Air Temperature Control, Inc. If you’re in need of HVAC service or repair in Belleville and the surrounding areas, Air Temperature Control, Inc. is the company for you. Learn more about our HVAC company today and contact us for any HVAC maintenance you might need.